Half way through shaking my money maker on stage with Dumpstaphunk last night, I had two epiphanies. The first was that I should really hit the gym more, because dancing that hard for more than two minutes is a workout. The second was that these dudes rock. Now, I’ve seem Dumpstaphunk several times, mostly Sunday night at Tips during Jazz Fest when I am living on vodka and energy drinks, but despite the fact that we weren’t in NOLA, it felt like a Jazz Fest set. It was pure magic. The crowd was digging it. “One Nation Under a Groove” was a funky crowd favorite, and I imagine most people, like myself were just excited to be out in a place with electricity, both on and off the stage. I gotta hand it to the HeadCount and Nolafunk guys, they organized a pretty great show. Anders couldn’t make it at the last minute and was replaced by the North Mississippi Allstars Duo of Luther and Cody Dickinson. I was pretty bummed when I heard the news because I have a slight obsession with Anders, but decided to get there early to check them out anyway. They seemed really excited to play for us and in turn, I got really excited to see them. Besides wanting to give both brothers haircuts, I would say they were pretty solid and by the end of their set, I forgot Anders was ever supposed to play. While I understand that Bela Fleck is a technical genius, I found him to be a weird addition to the lineup. He played some patriotic songs, but I would have prefered to hear him while sitting in some grass somewhere potentially smoking some grass. And after getting down to Questlove’s DJ set while watching a few couples make out to the slow jams, having to stand and sway to Bela was kind of a buzz kill. It felt like every bassist came on for the third set which went on until around 1am. Scott Metzger, Eric Krasno, and Luther really complimented each other and everyone gelled onstage. 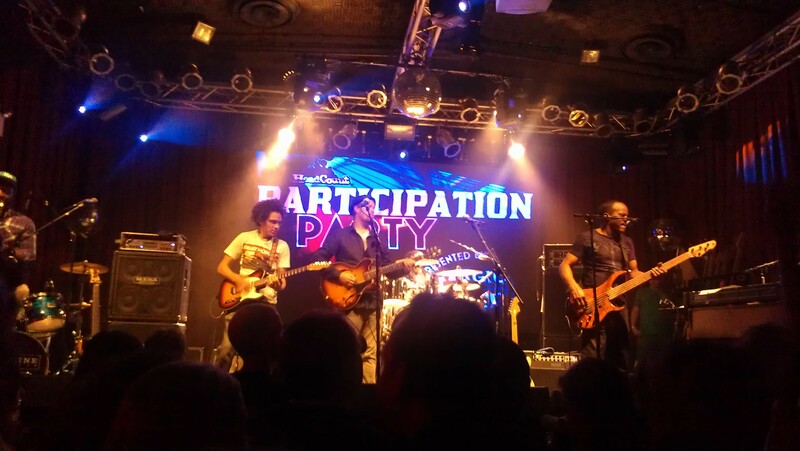 It was cool to see so many musicians playing their hearts out for the crowd and for the victims of Hurricane Sandy. The spirit of New Yorkers, and more specifically music freaks, is overwhelming. One dude was booty shaking in a American Flag onesie. I was worried he was going to pass out from all the latex, but his spirit wouldn’t allow it. And from my end, it was so worth my massive Tuesday morning hangover and shin splints.